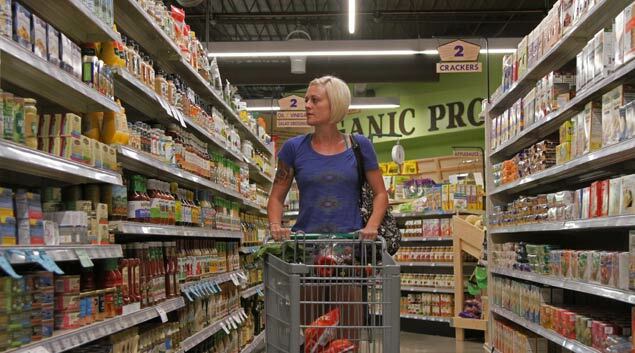 Jade Rennels, a Norman food stamp recipient is shopping at Natural Grocers, which sells natural and organic grocery items. Oklahoma is setting new records on number of households receiving food stamps, echoing a national rise in use of one of the nation’s most critical safety nets. That national increase has helped trigger an effort, led by an Oklahoma congressman, to roll back benefits in the food-stamp program. Last summer, after the state set a series of monthly food-stamp records in 2011 and national figures had soared, Oklahoma U.S. Rep. Frank Lucas, R-Cheyenne, began pushing strongly for changes that would tighten eligibility for the Supplemental Nutrition Assistance Program, or SNAP. Lucas and other conservatives say states loosened eligibility rules in recent years, and those changes need to be curtailed partly because of the growing costs. Critics of that approach say the increase is due more to a still struggling economy. Since Lucas introduced the provisions in the farm bill, use of food stamps has remained high. Oklahoma set an all-time record for number of households with at least one person on food stamps in October and November. In November, 286,778 households received the benefits, according to the Oklahoma Department of Human Services. About $945 million in food stamp benefits were dispensed to more than 600,000 Oklahomans in 2011. Although the government has not released an official estimate, fewer Oklahomans are expected to receive food stamps under the Lucas-led legislative effort. One unofficial estimate projected that 20,000 to 30,000 households could be impacted. “The change affects the very neediest Oklahomans,” said Paul Shinn, a public policy analyst at the Community Action Project of Tulsa County, who offered the estimate. Lucas’ bill passed the House Agriculture Committee, which he chairs, in July, but has since stalled and never made it to a floor vote in that Republican-controlled chamber. A bill, with far fewer cuts in food stamps, won approval in the Senate, where Democrats hold power. Despite those differences, signs have emerged that efforts to pass the new farm bill, including food-stamp changes, could become part of any agreement to avoid a year-end “fiscal cliff,” in which certain tax breaks end and spending cuts take effect. However, Lucas said earlier this week that he was pessimistic about the chances of a fiscal-cliff agreement being reached by year-end. “Will there be a big deal? I’m kind of cynical right now,” he told Oklahoma Watch. He did say he had talks with other key House and Senate members involved in the farm bill and as a result believes quick action on a new farm bill could occur in 2013. Oklahoma’s share of households on food stamps is higher than the national average. Recently, the Census Bureau reported that from calendar year 2010 to 2011, the state saw a 5.1-percent increase in households on food stamps, according to estimates from its American Community Survey. Oklahoma had the 20th highest percentage of households getting food stamps, at 14.3 percent, in 2011. By another measure – the total number of people on food stamps – usage has slipped in recent months compared to the same period last year. But numbers remain second-highest behind last year’s record figures. State DHS officials say the upward trend in the number of SNAP cases could come from a number of factors. Routinely, Beutler said, 44 percent of all Oklahomans being fed through SNAP are children. “We take very seriously our commitment to serve our state’s most vulnerable citizens, and OKDHS strives to help feed those who are hungry,” he said. Lucas said he has not tracked the food stamp situation in Oklahoma. “We’ve not been doing these policy judgments based on what the effect would be in Oklahoma,’’ rather from a national perspective, he said. While not commenting on any specific state, Lucas said changes made by states in their SNAP programs appear to be gaming the system enacted under the 1996 welfare reform law in order to maximize federal dollars. Lucas wants to undo changes that states have made in recent years. With the U.S. Department of Agriculture’s approval, Oklahoma made such a change in 2009 by eliminating a resource asset test for households. An official at the state Department of Human Services said the 2009 change broadened categorical eligibility for SNAP, but that the bad economy, not the change, is the reason for the 2011 spike. DHS spokesman Beutler said the 2009 change was made to allow the program to serve more clients. The change allows clients to help themselves, he said. For example, Beutler said a family could save money for a child’s education, ultimately allowing that child to become a more productive citizen. Lucas has accused the Obama administration of encouraging states to take liberties with the program. He has accused some states of circumventing the system by sending a check for energy assistance for as little as $1 to residents who then qualify for higher SNAP benefits. By ending such practices, Lucas said his bill, the Federal Agriculture Reform and Risk Management Act, would not only focus SNAP funds on those who really need such assistance, but also help implement billions of dollars in nutrition reforms and deficit reduction. According to the House committee, the bill would cut $16.1 billion over 10 years from the $772-billion program. “I believe most Americans will agree a 2 percent cut in food stamps is reasonable,’’ Lucas said. He also insisted the proposed legislation would not bar those who qualify for assistance under SNAP from receiving benefits. McGovern dismissed claims that the proposed cuts would merely close loopholes, adding that struggling families turn to SNAP as a last resort. Shortly after the committee sent the bill to the full House by a 35-11 vote in early July, U.S. Agriculture Secretary Tom Vilsack said the cuts proposed for SNAP would deny much-needed food assistance to 3 million Americans, including low-income working families with children and seniors, and would also eliminate access to school meals for 280,000 children. Asked for specific information about the impact on Oklahoma, the USDA referred to information put out by the Center on Budget and Policy Priorities. A spokeswoman with the center cited figures prepared previously by the administration on a Republican budget measure, saying the provisions were the same. Those figures indicated about 47,000 Oklahomans would lose access to SNAP benefits. Shinn, of the Community Action Project of Tulsa County, said the changes championed by Lucas may not mean that Oklahoma families are automatically ineligible for SNAP assistance but forces them to apply separately. “Many will not do so,’’ Shinn said. Perhaps 3,000 Oklahoma children who now are automatically eligible for free school meals could lose that benefit as well, Shinn projected. Passed several weeks ago, the Senate’s version of the farm bill, with its smaller changes to food stamps, drew a much more positive response from Vilsack.Oklahoma’s two senators – Republicans Jim Inhofe and Tom Coburn – voted against the bill. Inhofe’s office said the senator had an amendment giving states nearly complete control of nutrition assistance programs, but that his suggestion was blocked. The Number of Oklahomans receiving food stamps through the Supplemental Nutrition Assistance Program, or SNAP, has increased by 14 percent over the past two years. Source: Oklahoma Department of Human Services, U.S. Department of Agriculture.